The return period for a pair of curtains that I bought a few weeks ago was about to expire. 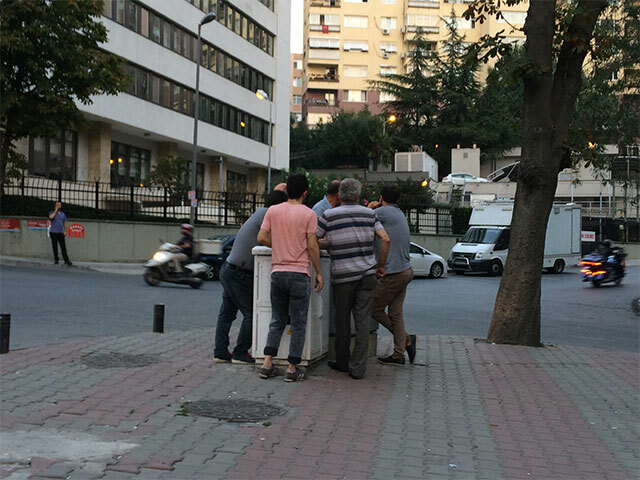 On Sunday evening, at around 7 p.m., I went out of my house in the Gayrettepe neighborhood and headed towards the nearby Cevahir Shopping Mall. I was going to return the drapes that I bought earlier and pick new ones and in the meantime take an evening walk. The Gayrettepe Public Security Branch Directorate was on my way. 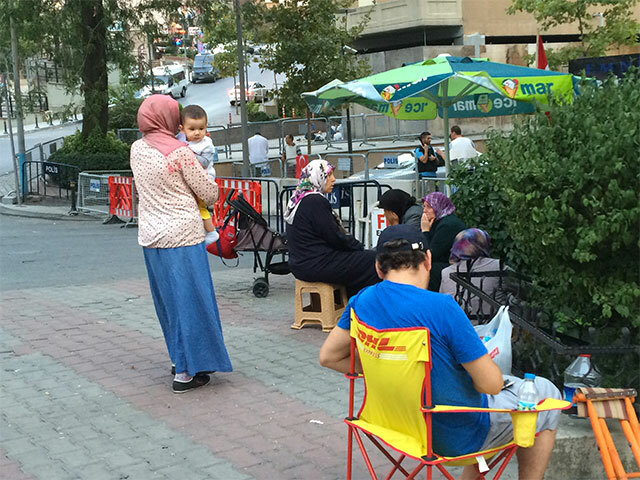 Right next to the directorate building I saw people waiting for their relatives who are in custody. Only three weeks ago, I was at that very spot, waiting for my colleague, the journalist Bülent Mumay, and later for my professor, the poet Hilmi Yavuz. This place has almost turned into a permanent station of suffering with the only change being those who stand in wait. That Sunday evening, among those holding vigil, were mothers with their babies and elderly people. Some of them had brought with them folding picnic chairs. They were all desperately hoping to hear a piece of news from inside the Public Security Directorate. Thinking I might Tweet about it or perhaps use it with an article later on, I snapped two photos of the crowd and walked away. I had a pair of curtains to change. And thus all of a sudden I found myself inside the Public Security Branch. Then they started investigating me while in the meantime having “small talk” with me. I didn’t look like a bomber or anything but I guess I wasn’t too favorable a journalist for them either. Among the questions I was asked were “Do you write about the schools that are being shut down?” and “Did you work for the Taraf daily before?” They held me for hours without even starting a formal procedure. In case anything happened to me there, there was no official record, nor did anyone know that I was being held. When I told them, “You cannot keep me in custody without papers,” the police officer slammed the door, banged a real hard fist on the table, and said: “This is emergency rule, we can hold you until morning without any records if we want to, we can do anything, you can complain whenever you’re free.” Since they hadn’t started any paperwork, I wasn’t entitled to the right to call a relative. The police officer told me something along the lines of: “If you’re that considerate of your relatives, don’t take photos in the middle of the street. I for instance care about my relatives and when something [a scuffle or some other incident] happens near me I don’t even look to see what’s happening.” The shopping center had already closed and I was feeling like I was about to be thrown into a bottomless well. Then they told me, “Somebody is looking for you” and the course of events started to take a different turn. Luckily, when the police officer first told me to “go with” him, I had called my friend, the lawyer Veysel Ok, from the independent journalism platform P24, on my cellphone. When Veysel called me back he couldn’t reach me and so he was worried and he called the Gayrettepe Public Security Branch only to be told that they had no records with the name of Tuğba Tekerek. He didn’t trust them and so he came over to the directorate to check in person. I was very lucky. Somebody out there knew I was being held and as of that minute, it wasn’t going to be that easy for the police to do whatever they pleased. Only one Tweet was enough reason to be taken into custody. And I was headed to the detention cell. As I was wondering whether I was going to be alone in the detention cell or share the room with another person, the gate opened and I was met by the sight of dozens of shoes. And odor. Inside the three detention cells that could normally accommodate a maximum of three to five people, there were 27 people in total. People were lying on the floor, with their knees pulled up, because there was simply not enough room for one to sit or lay on the floor with their legs stretched. Later I found out that only a few days ago there were 43 of them and some of them even had to sleep on the corridor. When I joined the others in detention it was a little past 3 o’clock in the morning. My detention cell mates asked me if I was a stenographer as well. As I was trying to figure out what that meant, they explained: “We’re court reporters.” “… We all used to work at the Anadolu Courthouse.” Twenty-four out of the 27 were stenographers. They each had the job because they had successfully passed a test where they were required to type a minimum of 90 words in three minutes, and now they were in confinement for being members of “FETÖ” (“Fethullahist Terrorist Organization”). There was also an eight-month pregnant woman who didn’t take part much in the conversation, but was rather busy dealing with her uncomfortably big belly, with her discomfort written all over her face. She said that in addition to working as a court reporter she was also studying law -- a field she now hates. When the police operation began she was on maternity leave. When she found out that a search warrant had been issued for her, she told the prosecutor with whom she worked that she wanted to surrender. She also has a 3-and-a half-year-old daughter. “I have almost forgotten her face, I wish I had brought with me a picture of her,” she said with a sob. Another woman replied: “They wouldn’t let you. There’s not even a mirror in here!” Yes, this was a place where one could even forget how one’s own face looked like. The fluorescent lamp on the ceiling was switched on all the time, even during daytime. And since our watches had also been confiscated, there was no way of telling what time of the day it was. One could only see the sunlight percolating through a 10 centimeter-wide opening of a window behind another window that reflected on the wall across. The detainees were allowed to the courtyard for fresh air on an arbitrary basis, for arbitrary periods of time. For example, the day before, they were given five minutes in the courtyard around 5 o’clock in the evening. The same rule of arbitrariness also applied in one’s access to a toothbrush. We were feeling as though we were stuck inside the engine of an air conditioner that doesn’t do any good other than making a horrible noise. I was trying not to think about the hot air surrounding my body and how difficult it was to breathe. We had no idea how long this was going to last. The intention was to wear these people out and get them to “tell” things. The police officers had told them that almost all of the nearly 20 court reporters who had been referred to the prosecutor’s office before them were arrested. But after my release from custody I found out that almost all of those people had actually been released. Not only were these people being deprived of information, they were deliberately being misinformed. The next morning, around 11 a.m., a police officer announced my name. I left the premises with a feeling of guilt that still haunts me. I knew that P24, the Ben Gazeteciyim (I Am a Journalist) Initiative, independent media outlets that are too few in this country these days, all stood up for me. If it weren’t for them, I couldn’t have survived being confined in some place in the middle of nowhere. But for the people I saw there, it was far more difficult. As to the curtains, eventually I did change them -- despite a lot of people advising against it, or telling me to at least take a different route to the shopping mall. And despite my fears, I still took the same route. Furthermore, this time I had news for the relatives of people with whom I shared the same fate for one night. Last night marked the 10th day of their confinement, and almost all of them were still waiting to be interrogated. P.s: There is one proven fact that this experience has taught me: Solidarity is extremely important. I would like to take this opportunity to thank P24, Yasemin Çongar, Veysel Ok, Fatih Polat, and my friends at the Ben Gazeteciyim Initiative, and everyone else who stood up for me and voiced my situation publicly. 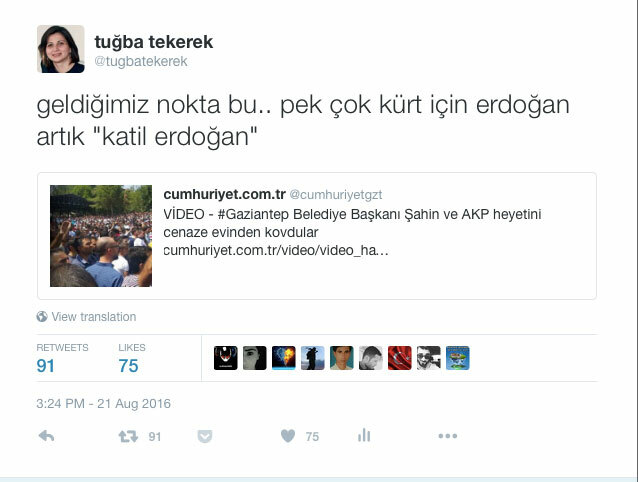 This blog was originally posted in Turkish on Aug. 26, 2016. English translation by Yasemin Gürkan.